Dreaming of an elegant outdoor affair? Outdoor Restrooms can provide the ultimate luxury for the most discriminating client. Our restroom trailers are stylish, elegant, and most importantly squeaky clean. With all our features, you won't have to compromise your dream location for modern convenience. 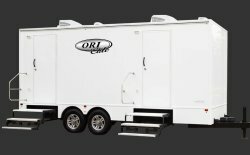 ORI is Kansas City's premiere company for providing luxury restroom trailers to Missouri, Kansas, Nebraska, and Iowa. For the most elegant and large affairs, our 8 stall Luxury 820 restroom trailer won't disappoint. At 8' x 20', it's our most prestigious trailer with tasteful cabins featuring 6-Panel doors, wall sconces, and wood grain flooring to give you the highest amount of comfort. 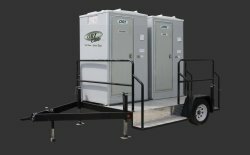 The Solar Petite Restroom Trailer is a great alternative to our basic restroom units. The features include amenities like that of our other trailers but is Utility free, allowing it to go to more locations. Our Petite comes with two private stalls; each contain a flushable toilet and a running water sink for convenience. 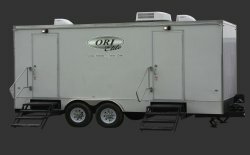 This restroom trailer is also fully self-contained so no water or electrical connections are needed. The Classic 212 trailer is one of our most popular models. If features fully equipped men and women’s separated restrooms, with amenities you expect from our luxury line of restrooms. Each stall comes with flushing toilets, mirrored-vanity, and more! Both are lighted, and have fresh water tanks on board for running water. Our Executive 820 luxury trailer is also popular. This easy-to-transport restroom trailer can be delivered at a moment’s notice. From weddings to festivals, and corporate functions, your guests will appreciate the extra pampering this trailer provides. Ladies - 4 private rooms each with Flushable Toilets, Double Vanity with Solid Surface Counters and Stainless Steel Sinks. Mens - 2 private rooms each with Flushable Toilets, 2 Urinals, Single Vanity, Solid Surface Counter and Stainless Steel Sink. 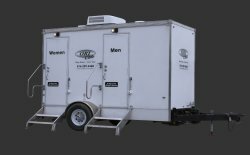 Perfect for your large outdoor event, the 8 stall Executive restroom trailer is our most commonly rented trailer. This trailer will give even some home's restrooms a run for their money. It features lavish stylings, with interior and exterior lighting. A full Bluetooth radio system and plenty of room for all your guests. Like What You See? Get In Touch With Outdoor Restrooms Today!